Finally a watermelon that fits properly in the fridge. that great watermelon flavor, now in easy to carry shape. They constrain watermelons into plexiglass cubes so that they're forced to grow like this.Umm...they sure look handy.No more killer watermelon rolling out of the fridge! 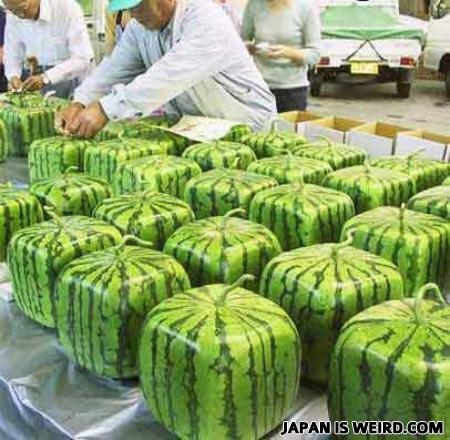 In Japan, Watermelon comes in cubes. Why do we still have round ones in England? They roll away when u try to cut them, roll around the fridge and are REALLY annoying. We want square melons! Feel like playing tetris while you set the table! Those are expensive.... They give those as gifts in special occasions like weddings. Dude, chill. America is the nickname for the country and North America is the continent that the United States of America is a part of. Argentina is on the South American continent. Japan doesn't "do" watermelons. But if they did, they'd be the best in the world. Not sure if japan or minecraft. Another fine fruit product of Hiroshima and Nagasaki. I can't believe noone Mentioned minecraft yet. Japanese eat LIVE fish, still flipping on the plate urgh, don't think I'd want anything from there. Gross. Yes. these watermelons naturally grow a barcode ( ベスト前年月日) ... AND a price tag. What? Round wasn't good enough? I understand that these watermelons grow an already filled in barcode as well: ベスト前年月日. Best before YYYY-MM-DD"
actually that is a technic invented by japanese immigrants here in Brazil and than sold all over the world, its cute and easy to put in the fridge! I call minecraft on this one. The new Minecraft update includes Watermelons now? Looks like minecraft's taking over.